Mr. Sunny Menghi pursued his bachelors in Law from Panjab University, Chandigarh and further went for advanced post-graduation studies from University of Petroleum and Energy Studies, Dehradun, with specialization in Energy Laws. Mr. Menghi also holds to his credit a three months course in Intellectual Property Rights from The Federation of Indian Chambers of Commerce and Industry(FICCI). 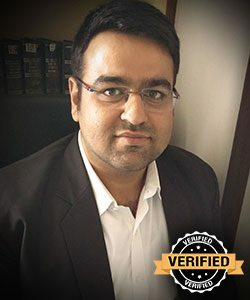 Upon completing Masters, Mr. Menghi joined the Lucknow District Court and The High Court, Lucknow Bench where he gained considerable experience in litigation. He has expertise in property matters especially RERA Matters. Mr. Menghi, with an appreciable amount of knowledge and experience in the field of Energy-Laws is committed to deal with corporate environmental laws in a distinguished manner. His interest and thorough understanding in the field of IPR make him an excellent resource in corporate law matters.